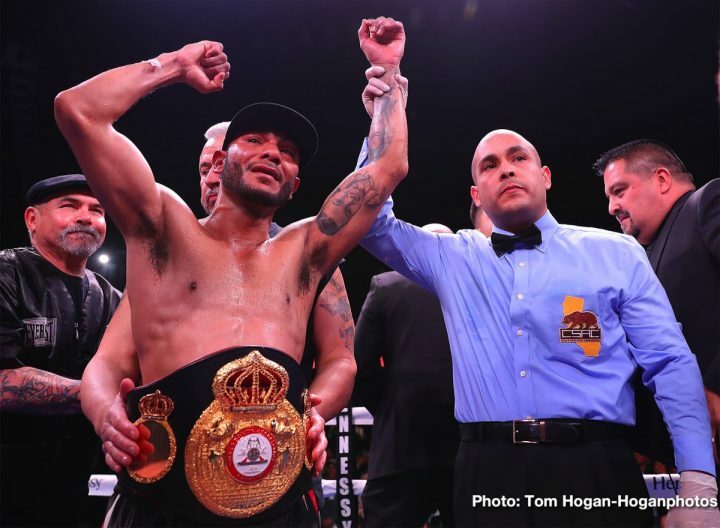 By Allan Fox: In a big upset, fringe contender Andrew Cancio (20-4-2, 15 KOs) ended the short title reign of WBA World super featherweight champion Alberto ‘El Explosivo’ Machado (21-1, 17 KOs) in stopping him in the 4th round on Saturday night on DAZN at the Fantasy Springs Resort Casino in Indio, California. Cancio knocked the heavy favorite Machado, 28, down three times in round 4 before the referee Raul Caiz Jr. stepped in and waived it off. The official time of the stoppage was at 2:16 of round 4. In hindsight, Golden Boy Promotions made a mistake in picking out Cancio for their fighter Machado to make a voluntary defense against instead of someone a little less dangerous. You’ve got to respect Golden Boy for picking out a live dog for Machado to face, but if they had a chance to do this over, they likely wouldn’t have had Machado face Cancio. This move blew up in Golden Boy’s face. However, they likely made sure that Manchado had a rematch clause in the contract with Cancio so that he can face him in the next fight if he were to lose. The way that Machado lost tonight, it’s unclear whether the outcome would be different in a second fight between these two. The beginning of the end for Machado came when he knocked down by a long stabbing right hand body shot from Cancio. Machado wasn’t expecting the long body shot from the much shorter 5’6″ Cancio. Machado dropped to one knee after getting hit with the bunch. After the action resumed, Cancio stormed forward and dropped Machado with a hook to the midsection. Machado was still too hurt to handle that punch to the body. Machado got back up and was backed up against the ropes, and knocked down by a head shot. The fight was then stopped by referee Raul Caiz Jr.
Cancio, 30, was knocked down in the first round by a big uppercut from the much taller 5’10” Machado. At that point n the fight, it looked like Machado was on his way to an easy win. Cancio would later say that was a flash knockdown. However, it looked Machado caught Cancio with a huge shot right hand while he was bent low, and the punch had too much heat on it for the challenger to stay on his feet. This was a real shocking win by Cancio, as nothing in his background of his 13-year pro career would suggest that he would pull off an upset like this. Cancio had been beaten three times in the last seven years in losses to Ronny Rios, Joseph Diaz Jr. [9th round TKO] and Roger Gonzalez (28-6, 18 KOs). Gonzalez was a journeyman, and he beat Cancio. The boxing fans and boxing media had a good reason to doubt Cancio. He’d never beaten anyone of note, and he’s even lost to journeyman level fighters in the past. There was nothing on Cancio’s resume that would suggest that he could pull off an upset like this. Cancio definitely listened to his trainer, and you could see that the fight was turning around starting from round 2, when he started to land powerful body shots. The slender Machado didn’t react well to getting hit to the midsection. It was a much different situation compared to when Cancio was attacking him with head shots in round 1 Machado had no problems handling the punches to the head from Cancio. When Cacnio changed things up in round 2, that’s when the fight turned around, as Machado started backing away.